by the P.O.W. NETWORK 2001. Lam San 719 was the last major operation of the Vietnam War. It involved American multi-service support of ARVN troops in an invasion of Laos. The targeted area began around the city of Tchepone and extended south along the Ho Chi Minh Trail. The operation was a concentrated attempt to halt North Vietnamese troop and supply movements. After the ARVN successfully took Tchepone, they elected to withdraw. American Marines and Army aircraft helped them withdraw back into Vietnam. All the while, NVA troops followed, and withdrawal, at times, was very difficult. assistance to all helicopters. The ARVN on the ground radioed Brandt, "We're completely surrounded," and asked Brandt to expend ordnance on his smoke (a detonated smoke grenade, used to mark location). For the rest of the afternoon, Brandt and his crewmember, Alan Boffman stayed over the ARVN, returning to Khe Sahn for refueling and rearming three times. He expended ordnance as directed by the ARVN sergeant on radio and dodged NVA fire on low-level flights to pinpoint the exact ARVN location and calculate the best approach route for rescue helicopters. lost my engine and my transmission is breaking up. Good-bye. Send my love to my family. I'm dead." Then, the Cobra became a ball of fire and crashed in the trees, rolling onto its right side. With knots in their throats, the extraction helicopters continued their mission. Of the original 420 ARVN who entered Laos, only 88 were left. They had fought hard for 6 weeks. The helicopters were clearly overloaded, and some had great difficulty staying airborne on the trip back to Khe Sanh. ARVN were hanging from the skids of the aircraft in a desperate attempt to reach the safety of Vietnam. Many fell, some were injured on landing. Of the 88 at the crater, only 36 made it back to the safety of Khe Sanh. For Brandt and Boffman, little hope remained. They died as they lived, helping others, and with honor. 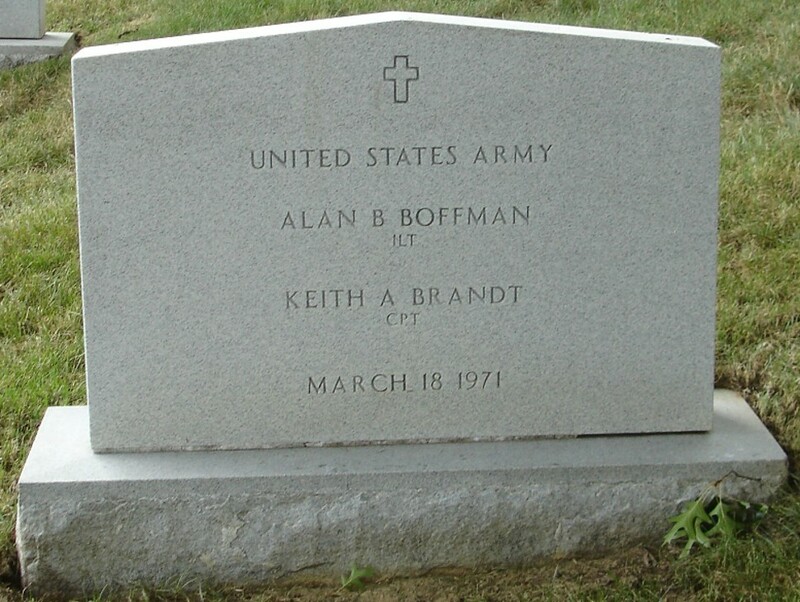 In mid-January 1990, a joint U.S./Lao team excavated the crash site of Brandt's helicopter and recovered human remains which were later identified as being those of both Brandt and Boffman. For their families, at least, comes the certainty of death. For many of their comrades, however, clear answers are not forthcoming. Laos is often called the "Black Hole" of the POW issue because, of nearly 600 Americans lost there, not a single man was ever released that had been held in Laos. The Pathet Lao stated on several occasions that they held prisoners, yet we never negotiated for their freedom. These men were abandoned by the government for which they bravely fought. Subject: Fw: Nobody knew his name. His call sign was "Music One Six". His voice was very deep, clear and unforgettable. Everyone there knew who "Music One Six" was, but nobody knew his name. His remains, and those of his copilot First Lieutenant Alan Boffman, came to the United States on 19 July 1990, 19 years, four months and one day after being shot down in Laos, 18 March 1971. It was during LAM SON 719. "Music One Six" was the leader of an attack helicopter section from "D" Company, 101st Aviation Battalion. He and his section were assisting in the extraction of 1st ARVN Infantry Division's 4/1 Battalion after six weeks of heavy combat in Laos. The 4/1 Battalion had a strength of 420 when they had been inserted 40 kilometers into Laos by helicopter combat assault. After six weeks of continuous contact with North Vietnamese Regulars, the battalion had been reduced in strength to 88, 61 of which were wounded. An English-speaking sergeant whose call sign was "Whiskey" was in command and had the only operable radio. They were surrounded in a bomb crater at the base of a 1,500 foot escarpment near the Xe Pon River. The enemy had loudspeakers and was calling for the unit to surrender. unit. He said "Spasm Two Two (Operations Officer of the 173 Aviation Company) this is Music One Six, follow me and I will lead you to the friendlies". stated, "My mast is on fire and I've lost my hydraulics. There they are twelve o'clock. 100 meters, I'm going to try to make it to the river." Smoke and flames could be seen trailing from his gunship as it turned toward the river. His rotor RPM was decaying as the rotors noticeably began to slow down. "I've lost my engine and my transmission is breaking up. Good-bye. Give my love to my wife and family", were "Music One Six's" last words as his helicopter crashed and became a ball of fire. Everyone in the air over the bomb crater knew that they had witnessed an unparalleled act of courage and selfless devotion to duty; that one aircrew had given their lives so that 88 other soldiers might live. Everyone there will always remember "Music One Six". But nobody there that day knew his name. The urgency of a situation involving fellow soldiers on the ground, had everyone together that day. To paraphrase General MacArthur, "I know not of the dignity of their births, but I can attest to the dignity of their deaths..." No heroes ever died more courageous deaths. I was proud to be with them on the field of battle that day. I was privileged to be at Travis Air Force Base on 18 July 1990 when "Music One Six" Captain Keith Brandt (age 31 at death) and his copilot 1LT Alan Boffman (age 24 at death) came home. I was proud to salute their caskets on behalf of their many comrades who served with them that day in Laos. None of us will ever forget them.